When Joe Zimmerman takes his dogs, Millie and Ruby, out to play in the backyard, like many rural residents, he bumps into rows of wild prairie grasses. Unlike many rural residents, Zimmerman knows exactly what those grasses are. Zimmerman is a Research Specialist on Erik Sacks’ team for CABBI, the Center for Advanced Bioenergy and Bioproducts Innovation. A University of Illinois alum from Avon, Ill., he graduated and went directly into corn fields studying hybrids, genotypes, and crop breeding with AgReliant Genetics LLC. “It was really rewarding to see the research, the hybrids we had studied, and the genotypes we had planted and started off with become commercial and become successful,” Zimmerman said. Though Zimmerman can now boast that he knows just about every small town in the Midwest from his work in the corn industry, he was ready to stay in one place and put down roots with his wife, an architectural designer, and his two pups. When the opportunity to work for CABBI opened up at the U of I, Zimmerman was excited that he could continue to marry his love of the outdoors with research. “A lot of my roots and specialties are in setting up field trials and being out in the field and collecting data and harvesting materials. That’s what I’m passionate about,” Zimmerman said. Sacks’ team, and Zimmerman, are a part of the Feedstocks Theme within CABBI. Research in this theme is focused on using plants as factories — engineering crops that can produce high yields of biofuel. Feedstock researchers are trying to breed crops that will contain biofuels or other valuable chemicals within the stems of the plants, rather than in the fruits, as stems in these grasses are an enormous percentage of their biomass. One particular grass Zimmerman works with is Miscanthus giganteus, a large, hearty, perennial grass that has been established in many Midwestern prairies. They are cross-breeding Miscanthus parent plants to create new genotype hybrids. Breeding Miscanthus is a fairly simple process: Place the plants side by side in a curtain, similar to a shower curtain that closes around the plants so they can cross-pollinate with one another without fear of contamination from the pollen of another plant. After cross-pollinating different Miscanthus hybrids, they cultivate it in small cell trays, where they grow. This process looks similar to when a gardener gets seeds started indoors in the spring. Once the Miscanthus has grown, they are assigned their final resting place in a repetition and plot then placed out in the field to grow. 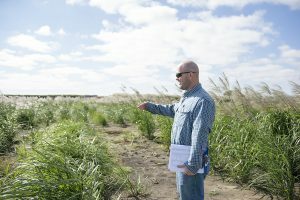 “The whole goal is to produce hearty, rigid, healthy, strong Miscanthus and to see how much biomass these trials yield,” Zimmerman said. CABBI researchers recently started two large trials in the summer of 2018 that will be one area of focus of their work over the next several years. They planted at the University of Illinois’ Energy Farm, where Zimmerman works from, as well as in Wisconsin, Alabama and Mississippi. When Zimmerman walks into the field, he can take a look at the leaves, the stems, the height, and the basal circumference and make fairly accurate predictions about how those grasses will develop and mature. “One of the draws to Miscanthus is that it’s generally very hardy. It can pretty much grow with very little nutrients, and in poor soils. Once it’s established, it can even handle drought fairly well. 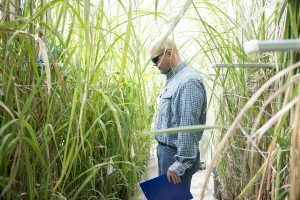 You can stick Miscanthus in undesirable crop land; it will do much better than traditional crops.” Zimmerman said. 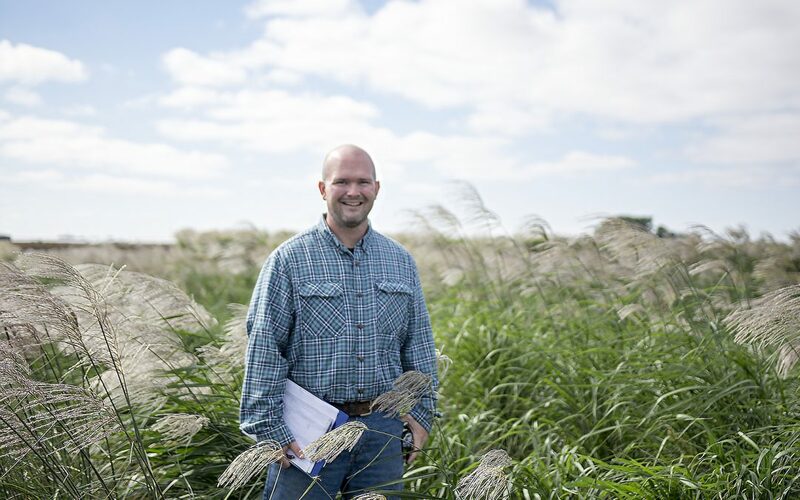 When Zimmerman walks out into his yard, he sees more than the prairie grasses, more than Miscanthus. He sees the future.